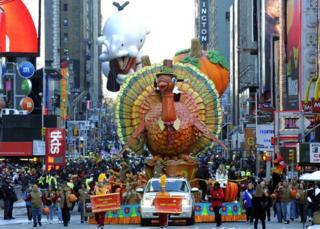 Thanksgiving is an American holiday which takes place every year on the 4th Thursday in November. It's a big celebration and now more people in the UK have started to celebrate the holiday. 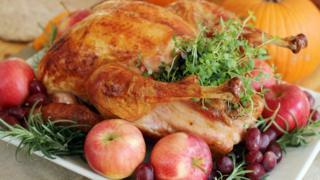 Here are our top five thanksgiving traditions. 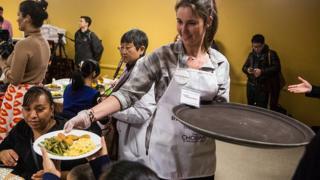 A volunteer serving Thanksgiving meals to people who struggle to afford to eat. People often want to give to others on thanksgiving, they tend to do things like spending the day volunteering to serve thanksgiving dinner to the homeless. Thanksgiving is seen as a time to be thankful for all the good things in life. Many people attend religious services, say prayers at dinner time and tell others what they are thankful for. There are big parades all over the US on thanksgiving day, the most famous one is Macy's Thanksgiving Day Parade held New York City every year. The parade has huge floats, large cartoon character balloons and marching bands. The float that usually ends the Parade is the Santa Claus float, as an unofficial sign of the beginning of the Christmas season. The American president stops one turkey every year from becoming Thanksgiving dinner. Since 1947, the National Turkey Federation has given the President one turkey every thanksgiving. 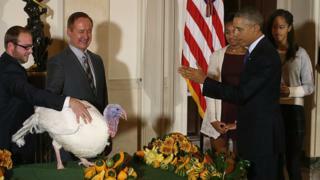 Pardoning turkeys became a tradition in 1989. The turkey who is freed then lives out the rest of its days in a petting zoo. 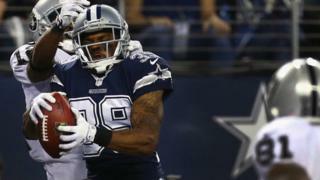 American football games are held on Thanksgiving Day every year, it's a tradition kept by the National Football League. Why turkeys? Wild turkeys were hunted when Thanksgiving first started, and it became more popular as the Thanksgiving meal of choice after American President Abraham Lincoln declared Thanksgiving a national holiday in 1863.